Psoriasis is an extremely common skin condition that effects millions of people worldwide. It affects around 7.5 million people in the United States alone and is the most common autoimmune disease in the world. For people with psoriasis, their standard of life can be badly affected by this painful and irritating condition and it is important to be aware of the triggers as well as the precise type of psoriasis that they are affected by. Knowing which type of psoriasis you are suffering from can help you to avoid triggers and also help your doctor come up with a treatment plan. The majority of people will only suffer from one kind of psoriasis at any one time but unfortunately even after your symptoms have disappeared, a new type of psoriasis may occur as a response to a new trigger. There are actually five official kinds of psoriasis with a number of subcategories. This form of psoriasis which is also referred to as psoriasis vulgaris is by far the most common affecting around 8 in every 10 people with the condition. This type of psoriasis is characterized by inflamed, raised patches of red skin which are covered in white or silvery colored scales. These patches of skin tend to burn, cause irritation and itch. Plaque psoriasis can occur anywhere on the body but typically appear on the knees, elbows, scalp and lower back area. This form of psoriasis is characterized by smallish red dots on the body and is the most common form of psoriasis after plaque psoriasis. The familiar red spots can appear all over the body. They are common on the limbs and the torso but can also appear on the scalp and the face. The spots are not typically as thick as the patches you get from plaques psoriasis but over time, they may actually develop into the plaque psoriasis. Guttate psoriasis tends to occur during childhood or in young adults. It often results from a trigger factor like stress, strep infection, skin injury or medication. This type of psoriasis can disappear for a long period after a short treatment period. This type of psoriasis which is also referred to as flexural psoriasis tends to develop in the folds of the skin especially the armpits, the groin region and below the breasts. Inverse psoriasis is usually smooth, shiny and red in appearance and is often triggered by a buildup of yeast. The majority of people suffering from inverse psoriasis also have a different type of the condition elsewhere on their body. 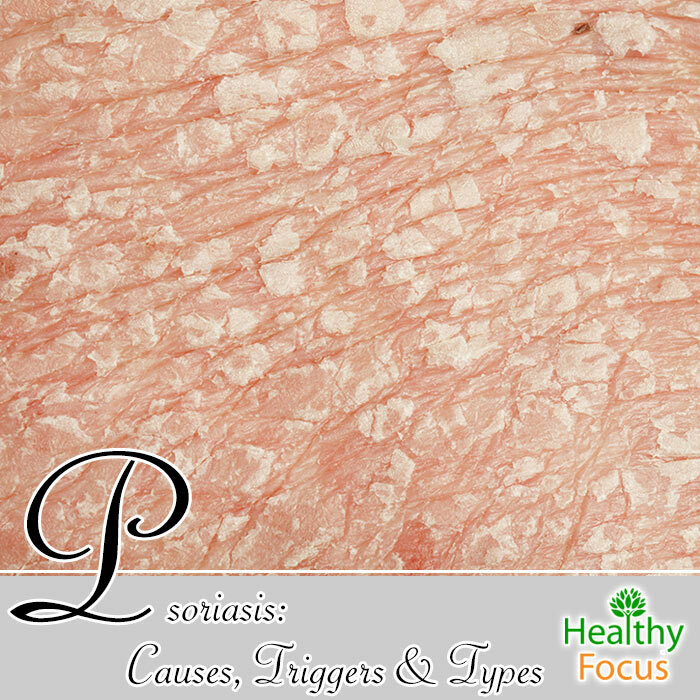 The areas between the folds of the skin where this type of psoriasis develops contain a lot of moisture and sweat. This moisture prevents the skin scales from being shed and the skin on skin contact means that it can be extremely irritating for sufferers. There are numerous topical skin treatments for this type of psoriasis. This kind of psoriasis is not so common and typically affects adults. It is characterized by pustules which are pus filled bumps that are surrounded by reddened skin. The pustules look nasty and infectious but they are not actually infectious. Pustular psoriasis can occur all over the body but often appear on a single area such as the feet or the hands. When pustular psoriasis occurs all around the body, it is categorized as ‘generalized’ pustular psoriasis. This can be a very serious condition and requires immediate medical intervention. It can result in symptoms like fevers, chills, nausea, muscular weakness, elevated heartbeat and nausea. This is a far less common form of psoriasis nut is also among the most serious. It can affect the entire body and it causes very painful fiery skin with a burned appearance all over the body. Other symptoms include itching and peeling, an increased hear rate and changes in your body’s temperature. It is important to see your doctor immediately if you are afflicted with this particular form of psoriasis. Hospitalization may be necessary as it can cause fluid and protein loss which may lead to serious illnesses. Other potential complications from erythrodermic psoriasis are infections, pneumonia and congestive heart disease. The 5 forms of psoriasis mentioned above are the official categories of psoriasis, nut there are other manifestations that are worth noting. Nail psoriasis does not come under one of the official categories but it affects as many as half of all people with other forms of psoriasis. It is often confused with a fungal infection because of its similarities to other common nail infections. Mail psoriasis may cause the nails to become pitted and discolored and may also result in a crumbling or loosening of the nail. It also causes spots and a thickening of the skin beneath the nails. Several forms of official psoriasis may occur on a person’s scalp. It can be itchy, irritating and often painful and may even cause a person to have severe dandruff. It is especially noticeable around the hairline but can also extend to the face, ears and neck. Scalp psoriasis can cause problems for basic hair hygiene as well as causing scratching that may result in scalp infections or hair loss and is a well-known cause of social stress for many people. Topical treatments can help but they require long term maintenance to be effective. Some 30% of those who suffer from a form of psoriasis will also have psoriatic arthritis – a painful and debilitating condition affecting the joints. It can be especially severe in the hands and fingers. There is no known cure but arthritis treatment and exercise can allow for periods of remission. While psoriasis is an autoimmune condition and the actual causes stem from the immune system itself, certain triggers are responsible for causing flare ups and for making the symptoms worse. The weather is a major factor when it comes to triggering psoriasis flare-ups. While warm and sunny weather typically helps control the symptoms, cold and very dry conditions can contribute to them. A number of infections including tonsillitis or strep throat can trigger guttate psoriasis and some other forms in the first few weeks following the infection. A number of medications can cause flare-ups. These include lithium, malaria drugs and beta blockers used for hypertension and arrhythmia. Some kind of trauma or injury to the skin can trigger a flare-up in many people suffering from psoriasis. Common injuries that could have this effect include burns, bruises, cuts, bites and grazes. Other possible triggers are vaccinations and tattoos. Drinking alcohol especially in excess can increase the chances of a psoriasis flare-up. Smoking is another potential trigger for a psoriasis flare-up in many people.